Home Retro rants Social norms From Simple to Showoff: Why Do Weddings Today Seem To Go Overboard? From Simple to Showoff: Why Do Weddings Today Seem To Go Overboard? Valentine's Day is upon us, and its a safe bet that after the holiday tens of thousands of Americans will be newly engaged. And it's a sure bet that an awful lot of these brides and grooms-to-be will end up spending an exorbitant amount of money on the ceremony and reception. Weddings in America have turned into lavish, showy (and show-offish) affairs, especially when compared to weddings of past decades. A couple of weeks ago I clicked on an article on MSN called "7 Things That Americans Waste Their Money On." Not surprisingly, item number seven was weddings. The average cost of a wedding today in the States is $26,645. Let's let that figure sink in a moment and do some comparison shopping. The Vince Lombardi trophy, made annually by Tiffany and Co., is worth $25,000. When I looked at gently used Audi A4s the other night online (just for kicks), most of the ones listed that were a few years old with modest mileage were priced around $25K. $26,645 is also enough to put a down payment on a mortgage and buy yourself a decent living room set, or at least a nice sofa. In fact, in that article I cited, one of the comments left was by a man that attended a wedding of two 20-somethings. The bride revealed that she and her new husband had very little saved for a home, but she was hoping her retired dad (who paid for the wedding) would help her out with that, too. 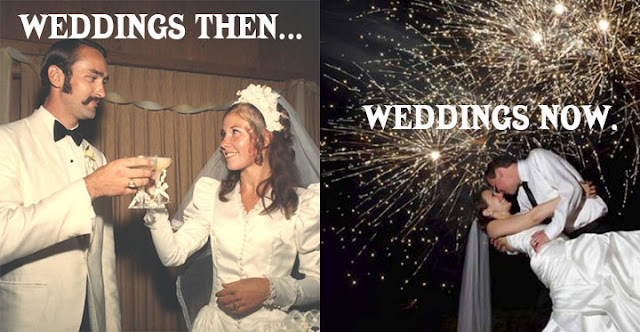 OK, with all fairness the rise of the bridezilla started taking place a good twenty years ago, if not more...so it's not just Millennials that have expected a royal wedding-type affair but people from my generation as well. The question is, why? Why waste all of that money on an over-the-top day that few people are going to ultimately remember, except for the couple getting hitched? 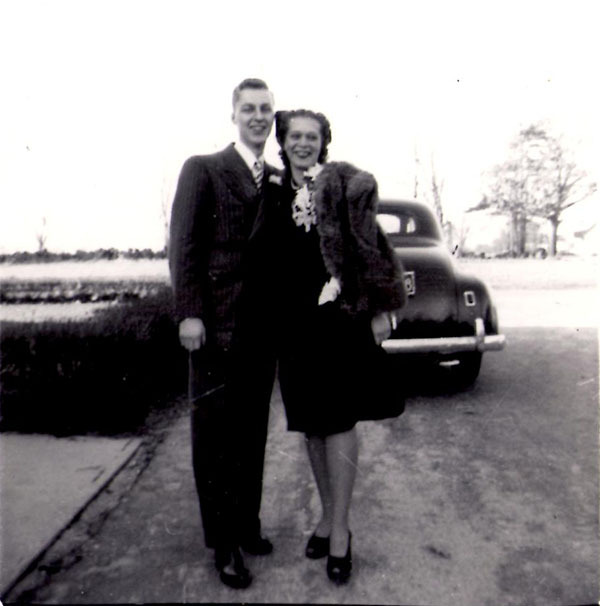 The photo above is of my parents on their wedding day -- February 1, 1946. As you can see, my mother didn't wear a bridal gown; she wore her best dress and a fur jacket. My father never gave her an engagement ring. She decided she really didn't want one, when she knew the money would be best served in a savings account to pay for a place to live (decades later, she got a tiny diamond on one of their anniversaries.) Speaking of which, my parents actually lived in a converted chicken coop for a short while on my grandparents' farm while my father went to work and saved money. That was how it was for a lot of these past generations; they had more common sense when it came to saving and spending. They also weren't so selfish; they were grateful for what they had. When Celine Dion married René Angélil in 1994, however, the wedding was as melodramatic as one of Dion's power love ballads: it featured a massive wedding "cake" comprised of over 2,600 French profiterole (or cream puffs), a seven pound headpiece made of Austrian crystals, real white doves, and artificial snowflakes. A lot of other celebrity couples seemed to have over-the-top weddings in the '90s. I'm not sure if that's what started to drive the expensive wedding phenomenon, but personally I do think it's possible to spend way too much on an article of clothing that you're only going to wear one day out of your life and never again. Thus came the rise of wedding planners an numerous wedding magazines and websites, all revolved around making your special day as perfect as possible. Don't get me wrong--I have nothing against people spending and enjoying money, particularly if they actually have it. However, it seems to me that too many young couples are spending a fortune on their weddings when they don't have it. A lot of people would be better off if they tried to curb the expenses and socked that cash away for a downpayment on a starter home instead. I guess the question is, why? Is it because they're selfish, spoiled, and/or have low self esteem issues where they feel some need to show off a bit? Sadly, some couples also expect guests and members of their wedding party to spend a fortune because of their selfishness, whether they can afford it or not. Thus, we've seen the rise of the destination wedding in recent decades, where couples get married on a tropical beach or another exotic locale. Not only is this expensive for the wedding party, but a bit of an inconvenience as well -- they're being forced to take a vacation whether it works with their schedule or not. Another thing I've noticed...the numerous amount of bridesmaids. It used to be a bride would have a maid of honor or maybe a couple of bridesmaids; now she usually has a throng of her besties wearing an ensemble that will most likely never see the outside of their closet again. The irony is that the most memorable weddings I have been to were the ones where it was obvious the couple did not spend a ton of money on the reception. Thus, these celebrations had their own unique touches whereas the ones I've been to (and one where I was part of the wedding party) that were thrown at local country clubs and involved expensive bridal gowns all kind of blur together for me as nearly one collective memory. I'm not saying that people should hire a justice of the peace, order some pizza, and call it a day, either. I believe in a happy medium, and maybe looking for ways to save money on certain areas (such as the dress or the reception venue) instead of blowing a fortune on what's only one day out of your entire lives. Just don't lose sight of the real reason you're getting married in the first place. That (parents wedding date) is my birthday (not the same year though). Cosmic. I don't know what it cost when I was married (for a brief time) in the first year of the 1990s. But I don' think it was more than a couple hundred dollars. 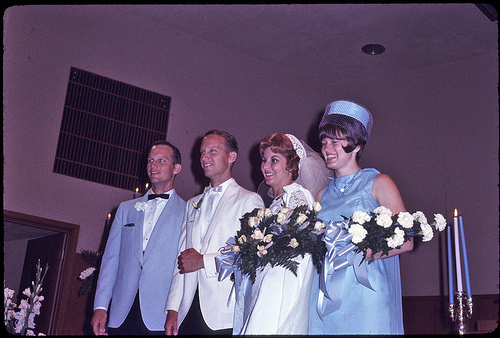 Pam, as the father of two young ladies in the early 20s, I shudder whenever the cost of modern weddings is brought up. It is simply insane. There seems to be a perverse inverse relationship between the average cost of weddings and the average length of marriages! I forgot to mention that one of the reasons I think the number of wedding guests is often out of control is because of the fear of offending someone. "Oh no, we can't exclude so-and-so. He'll be hurt." When I was a maid of honor in a friend's wedding a good 15 years ago, there were about 500 guests. She told me she didn't know several of the people that attended. It was because her mother insisted on inviting them. Even the son of one of her mother's friends was invited and came; a college kid that lived in NYC and didn't really know the bride at all. Today in my local paper's wedding section there was a couple that had their reception at a restaurant, with 50 guests in attendance. That's totally more my speed. There are many reasons that weddings are no longer simple ceremonies and have morphed into "Disney Movie Princess" presentations. From my experience as, a former wedding photographer, is that the "current generation" thinks only of the party and not of the life. The wedding is just one day. The Marriage is for the rest of your life. You're a Ford Salesman, Charlie Brown!